Fabric Mart Fabricistas: Made by a Fabricista: A Love Affair with Fabric! 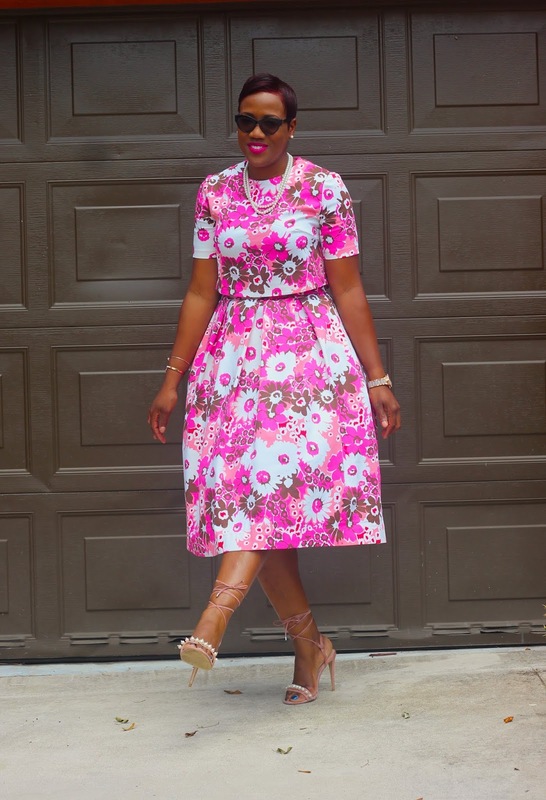 Made by a Fabricista: A Love Affair with Fabric! My Summer BREAK is officially over and I will be heading back to work on Monday! I had an amazing SEW summer and I can't wait to start the planning process for my Fall makes. Have you ever fell in love with a piece of fabric just by the touch and how it feels on the skin? In June's edition of Julie's pick, I wanted to order at least 10 fabrics just by the way it felt. Having a busy schedule throughout the school year, honestly, I never sat down and delved deeply into this amazing offer from Fabric Mart that was just a mere $5 a month. For years, I have been skeptical about ordering fabric online and have always followed brand ambassadors for different fabric stores to see how the fabric looks and drapes. I have had greats hits with Fabric Mart and one or two misses as I did not have knowledge of the fabric fibers, structure or aesthetic before ordering it. In May, when my monthly mailer arrived with Julie's pick selections, I decided to sit down for an hour and touch and feel every single swatch and read about the fabric content. The catalog of at least 30 swatches with detail description of fabric content and suggested patterns for the fabric is so worth it. This is a great offer especially for any self-taught sewist who does not have a formal education in Fashion Design or construction. I have been shopping lately just from Julie's pick as they offer a wide range of designer fabric at special discount pricing. ROCKING IT WITH A PETTICOAT! MY favorite tools that HELP! Sewing gauge, rotary blade, quilting ruler! The fabric that I selected for my August make is a Retro Floral Print Cotton Pique bottom weight fabric that I have never worked with before. The content is 97% cotton and 3% lycra which is perfect for this look. There were 2 prints of Cotton Pique bottom weight available in JUNE Julie's pick matched with a Gertie's Butterick pattern B6556 that I had in my stash. I really struggled to create either a dress or separates so I reached out to in Insta-family for a vote. The two-piece set got the most votes, so I opted to create separates instead. This print is perfect for this crop top and matching skirt set which gives the illusion of a dress. The skirt sits at high waist leaving no skin visible when worn with the matching crop top that I created from the remainder of the fabric. This chic yet tasteful look and fabric print is perfect for a garden or tea party affair. In addition, it can be worn with a cardigan or top for work. My other top 3 fabrics for this look would be a cotton linen blend HERE, a silk jacquard dot taffeta HERE, or this beautiful wool polyester satin jacquard HERE! The pattern that I chose for the top was last year's popular Spring top pattern from McCalls #M7542. I decided to shorten by cutting away 2 1/4 inch from the shorter view and not add any of the sleeve drama options. In addition, I included a zipper in the back as I was NOT sure how this fabric would lay with a keyhole. For the box pleated skirt, which I plan to wear without the crop top, I created it without a pattern. For the most part, I always gather or pleat a skirt based on my high waist measurement with about 1 to 1.5 inches of ease and add seam allowance for the zipper insertion and side seam. For my first 3 years of sewing, I mastered the art of making skirts without any patterns whatsoever. To create a clean smooth waistband, follow these steps highlighted below. It is easy and effective and will make your life so much easier in the end. Step 1: Select a piece of fabric that is enough for the length and width of your waistband. Cut the length of the waistband based on your finish waist circumference including ease (measurement) plus seam allowance. 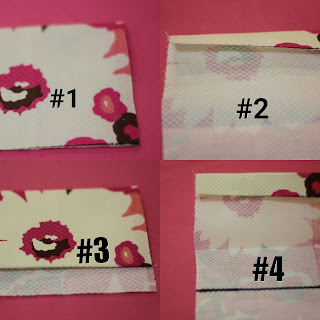 Fold fabric, mark, press and cut using a rotary cutter based on the desired width of your waistband plus an extra 5/8 to 3/4 inch. 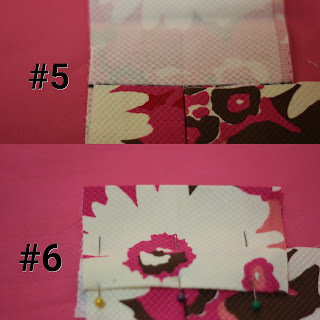 For example, I would cut on fold 3.25 inches if I wanted a waistband that is 2.5 inches wide. Step 2: Fold the front of the waistband over by 5/8 to 3/4 inches and use a seam gauge for accuracy and press. Step 3: Add the desired interface based on fabric weight and press waistband ensuring the width measurement is the same for the entire length of the waistband. Step 4: Mark back of waistband (the side that is NOT folded) at least 1 inches from the bottom. The mark lined should not be visible when the waistband is folded. (REFER TO PICTURE IN STEP 3). I marked mine at about 1.75 inches from the fold for my 2.5 waist band. Step 5: Line up pleated or gathered skirt on the marked line ensuring the back is laid flat and pin. This ensures that it is even all around! BE SURE TO PIN on the front of waist band and ensure that the back is flat and smooth. Step 6: Sew waistband on the right side (outside) of the skirt close to the seam (about 1/4 inch). Always check to make sure that when sewing, the back remains flat throughout the sewing process. WAISTBAND - INSIDE OF THE SKIRT! 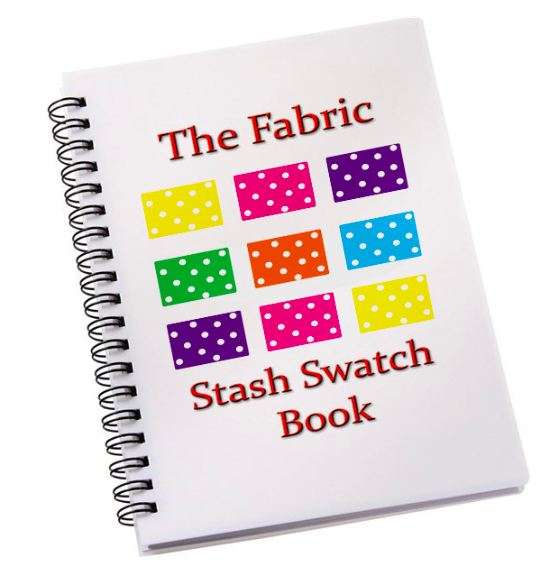 I have been saving all of my Julie's pick since May and found a few others and will be transferring all the swatches for different fabrics to my Fabric Swatch Stash book that I purchased recently from Les Fleur Style. This definitely will help me to develop a better understanding of fiber and fabric type. I am super excited to use both of her books to plan my Fall makes and will be giving away a set to a lucky reader. Be sure to stop by the post to learn how you can win. I am excited to see what Julie has this fall to finalize my holiday makes. I have been purchasing fabric mainly from Julie's pick the last 3 months and can't wait to cut into them. The prices for the array of designer selection is worth the $5 each month and I can't wait to use up a few yards of my Ralph Lauren sateen for pants. Thanks for reading and be sure to stop by my personal BLOG to see my latest makes! Thank-you for the beautiful pics and the great step-outs. Marcia, this is such a gorgeous dress! 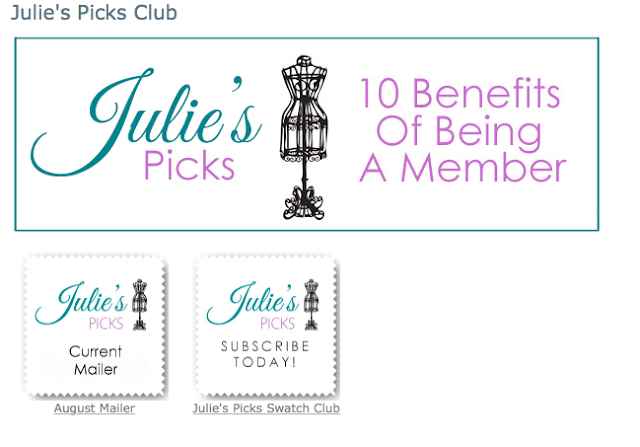 Thanks for reminding me how fabulous Julie's picks are! I need to resign up! Enjoy wearing this beauty! Thanks Sue!! Its actually a 2 piece, fake the dress look! Can I just say I am bedazzled! Brava!